On the Timesheet page it allows you to view and download your teams worked hours with just a few clicks. 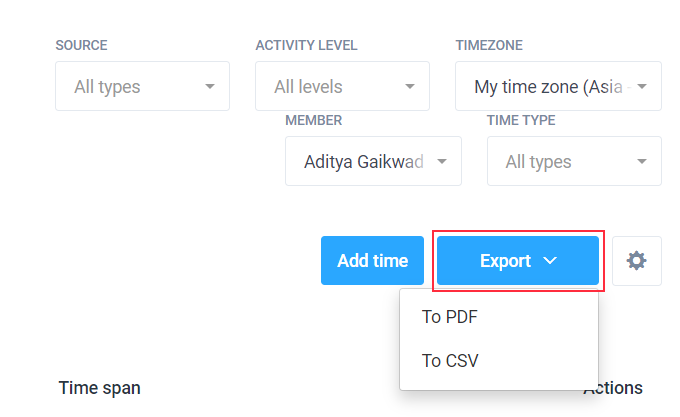 You have an option to export the timesheets for Daily or Weekly periods. Click on the timesheet tab on the left sidebar. Select the report type you want to view (Daily or Weekly). Indicate the Period and User details. Click on the Export button in which a dropdown of choices will be displayed. Click on the preferred format (CSV or PDF formats).